Video clip synopsis – The ultimate decline of cinema newsreels occurred with the coming of colour television. Broadband MP4 newsreelend_bb.mp4 (10.2MB), suitable for iPods and computer downloads. 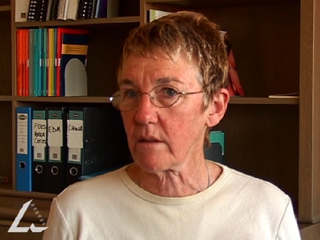 The interviews with Liz Jacka and Ray Edmondson were recorded for the website From Wireless to Web produced in 2005. Following the advent of television in 1956, newsreels in Australia shared the common fate of cinema newsreels in other parts of the world. The medium became a news magazine, gradually shrinking in length and increasing in sponsored content to compensate for diminishing budgets. In 1970 the two rival newsreel production companies combined: the all-Australian Cinesound Review joined forces with Fox Movietone News (Australian edition) to become Australian Movie Magazine. The venture quietly faded out as a production company in 1975. These days the collection of Australian cinema newsreels – a massive resource of historical and cultural significance – is managed by ScreenSound Australia, National Film and Sound Archive. The Cinesound-Movietone Newsreel Collection has been added to the Australian Memory of the World Register, part of UNESCO’s Memory of the World program. According to Liz Jacka, why were newsreels still popular in the early days of television? Describe the reasons that Ray Edmondson gives for the decline of the newsreel. What reasons does Ray Edmondson give for the fact that newsreels lasted longer in Australia than in other countries. Use the information in this digital resource to create a power point presentation on the impact of changing technology on Australian entertainment in the 1970s. Research the development of the Australian film industry in the 1970s. Create a storyboard for a documentary on the development and impact of Australian films during this period. Use the link below to start your research.